CHICAGO, IL. A bye week allowed players to heal a few bumps and bruises and generally rest from the grind of a long season. Would the time off leave the team a bit flat or short on motivation? Hardly. With the possibility of a playoff berth still lingering, the theme of this game was early and often. The Force racked up a franchise best 69 points, extending their shutout streak to four (overall record 5-2) against a game but severely overmatched Detroit Predators at Holmgren Athletic Complex. New faces and names were added to the offensive attack as the coaching staff made sure that everyone saw extended playing time. "Giving our rookies game experience at full speed should pay dividends for the future," said Coach Bill Smith. The Force started the tidal wave of points with the opening kickoff. Debbie Sanchez handed off to rookie Sharmaine Lee on a reverse. Two timely blocks by Jennifer Dulski and Bridget Fahrner sprang Lee down the left sideline for 75 yards. Offensive Game Day MVP, QB Sami Grisafe (6-12, 90yrds, 1td) calmly led her team downfield. An option pitch to steady RB Esther Henigan went for 18 yards and set up Henigan’s 5 yard td. The extra point was good by Tricia Charbonneau, who was busy converting on 7 of 9 for the day. 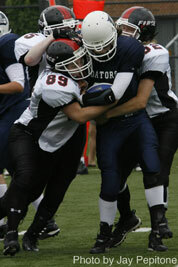 LB Becky (Punk) Thuestad recovered a missed handoff at the Predator 32. Grisafe found TE Kim Marks over the middle for an 18 yard pass completion. She went right back to Marks this time for 9 yards. One play later, Henigan burst up the middle from the 2. The pat made it 20-0 to close out the first quarter. The stifling defensive pressure led by Defensive Game Day MVP Shelley Picha, Ericka Bell-Coleman, Jessica McPeake, Linda Bache, Dulski, Thuestad, and Sanchez, gave the Force good field position on every offensive possession. Grisafe got a little stingy and ran the ball 3 straight times for 11, 10, and 4 yards down to the Predator 16. Rookie RB, Lori Kunc, who is emerging with each game, burst down the right sideline for pay dirt. At 6:11 of the third, Bell-Coleman recovered a fumble at the Force 46. Grisafe hooked up with Michelle Kania and hit her in stride for an impressive 42 yard completion. Grisafe shared the wealth this time going to WR Tashaunda Shumpert 12 yards for the score. After an interception by Kucar just before halftime deep in Predator territory, Grisafe found Kania who pulled in a 10 yard td pass. Defensive coordinator Chris Maniatis has an uncanny knack for knowing the next play that the opposition is going to call. At 13:03 of the third quarter, Maniatis told Dulski that a pass was coming her way. On the next Predator call, Dulski stepped up and returned the interception 40 yards. "No, I don’t have a crystal ball in my pocket," explained Maniatis. "I take pride in picking up tendencies from watching what teams do as the game progresses." The offensive line flowed like a well oiled machine allowing for the lopsided score. Accolades go out to Keesha Brooks, Melanie Stinson, Dawn Pederson, Rosalyn Bennett, and McPeake. Fahrner went in for an offensive series and made the most of her opportunity. A 7 yard run was followed by an easy carry from one yard out. Picha converted the 2 point conversion as the scoreboard read 55-0. The Force closed the scoring barrage when Jeannine Nebbeling scooped up yet another Predator miscue at the 35. Pederson took over at the controls and after a nifty 31 yard run, scored from the 4.